The subject of this review may have some readers double-checking the date of publication. 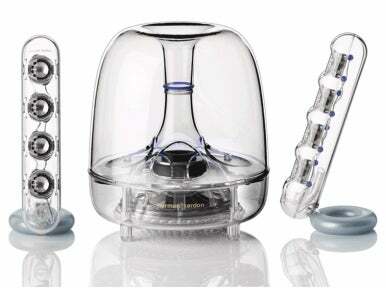 After all, Harman Kardon’s SoundSticks II speaker system, the universally-compatible successor to the original, Mac-only SoundSticks, has been around for a good many years. But in a market where products rarely last a year, the fact that the SoundSticks II is still available says a lot about the system’s staying power—put simply, exceptional popularity has extended the SoundSticks II's shelf life. Part of this appeal is undoubtedly due to the SoundSticks II eye-catching design, but the system also offers impressive performance at a reasonable price. The SoundSticks II is a 2.1 speaker system, which means it uses smaller left and right satellites for higher frequencies along with a larger subwoofer/amplifier component for lower frequencies. Nothing special there. But the SoundSticks II’s curves and shapes are truly unique, as are its transparent-plastic shells, which let you view everything inside—wires, transistors, you name it. The two satellites look much like large, glass test tubes, 10 inches tall and 2 inches in diameter. But instead of hosting a single driver, or two drivers of different sizes, like most satellite speakers, each of the SoundSticks II's satellites sports four drivers, each one inch across. The system provides 10 Watts of power to each satellite, and the satellite enclosures are, like the sub, ported to enhance lower-frequency response. Each satellite is supported by a 3.3-inch metal ring covered in non-slip rubber. The heft of this base—each speaker weighs a surprising 1.5 pounds—provides a good deal of stability for the tall, thin array above. Oddly, these bases are the only parts of the SoundSticks II system that clash with the overall design. The rubber coating over rough-finish metal gives the bases a sort of “glitter” appearance that just doesn’t fit with the smooth, transparent look of everything else. Each satellite is connected to its base using a clever metal hinge that lets you swivel the speaker’s body back and down, to any angle from vertical to horizontal. This allows you to position the speaker so the drivers are aimed directly at your ears—providing the best treble performance—regardless of how low your desk is. The hinge is easy to reposition, but tight enough to hold at any angle. Despite the fancy design, the system has a rather simple set of audio and connection features. The back of the subwoofer hosts only a power jack; a permanently attached 6-foot cable for connecting your computer (the cable terminates in a stereo miniplug); a 3-inch dongle for connecting the two satellites; and a dial for adjusting bass output. In my office, setting the bass level at about one-third of the maximum offered the best tonal balance. Other than that, the only other feature you’ll find are a pair of touch-sensitive, metal volume buttons—though no volume-level indicator—near the base of the right-hand speaker. Touch and hold a button with your bare finger to lower or raise the volume; touch both buttons simultaneously to toggle mute on and off. Unfortunately, there’s no additional input for connecting a second audio source such as an iPod or iPhone, nor do you get a headphone jack on either satellite, features that are common on computer speakers in this price range. In fact, there’s not even a power button on the system; the blue light on the subwoofer shines 24/7 unless you physically unplug the power cable. Thankfully, Harman Kardon hasn’t skimped on the audio performance. The SoundSticks II system provides very good sound quality, especially when it comes to treble detail and upper-midrange frequencies (surely due to the four-tweeter array in each satellite). Midrange performance is good, although slightly recessed compared to treble, especially at higher volumes. The system’s bass response is quite good for a 2.1 system in this price range, with one caveat: that you resist the urge to crank up the subwoofer level. As I mentioned above, I ended up setting this level at only one-third the maximum; too far above this in my office and bass became overbearing and fatiguing. But set properly, the SoundSticks II showed the clear advantages of having a separate subwoofer: the system was able to produce frequencies that even the best of the 2.0 systems we’ve tested couldn’t reach. While bass response began to roll off just above 80 Hz, it was still quite strong down to around 65 Hz. The system can also play quite loud, despite the relatively low power rating. I noticed some boominess in the 100 to 125Hz range at louder volumes on particular tracks, but overall the system can easily fill a decent-sized room with quality sound. One other thing worth noting is that the system has a surprisingly small “sweet spot”—the location, directly in the path of the tweeters, in which higher frequencies sound the best—despite having four drivers per satellite. Harman Kardon even mentions this limitation in the included setup guide. However, if you’ll be using the SoundSticks II at your desk, you may never notice this issue; it’s most noticeable when listening to the system from across a room or when moving around. While the SoundSticks II doesn’t have all the features—multiple inputs, treble and bass controls, a headphone jack…a power switch—of some other computer speakers, it’s easy to see why Harman Kardon has kept the system around for so long. The SoundSticks II’s appearance remains different—in a good way—from anything else on the market, and the system provides very good sound quality for the price (especially at street prices, which are roughly $130). Those who prefer rich, warm audio may be disappointed, as will those who prefer tight, accurate bass (though, to be fair, you won’t find much of the latter in this price range). But if your tastes lean toward clear treble detail with some bass impact, you’ll really enjoy these speakers.